I’ve been wanting to go back to Furnazhinas ever since I discovered this lovely village last year. 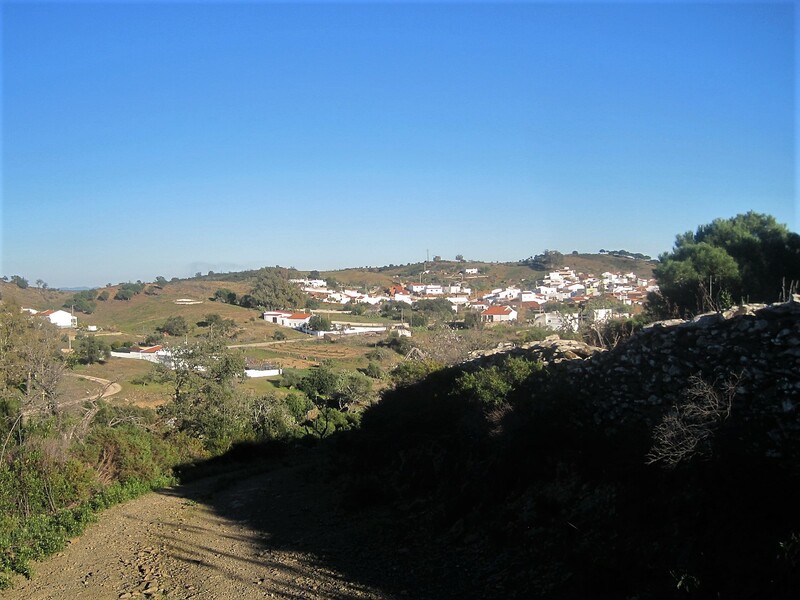 It sits up in the hills, at the eastern end of the Via Algarviana, a 300km inland walk which crosses the whole of the Algarve. The good news for me is that there are 2 much shorter walks which pass through the village, and on a gloriously sunny January day we decided to sample one. It was an easy choice. PR9 leads south of the village, signed Mina e Albufeira (not the popular one!) in the direction of the dam at Odeleite. It promised views over the water, and I was sold! Scarcely were we out of the village when we encountered solid looking stepping stones, beside an ancient well. 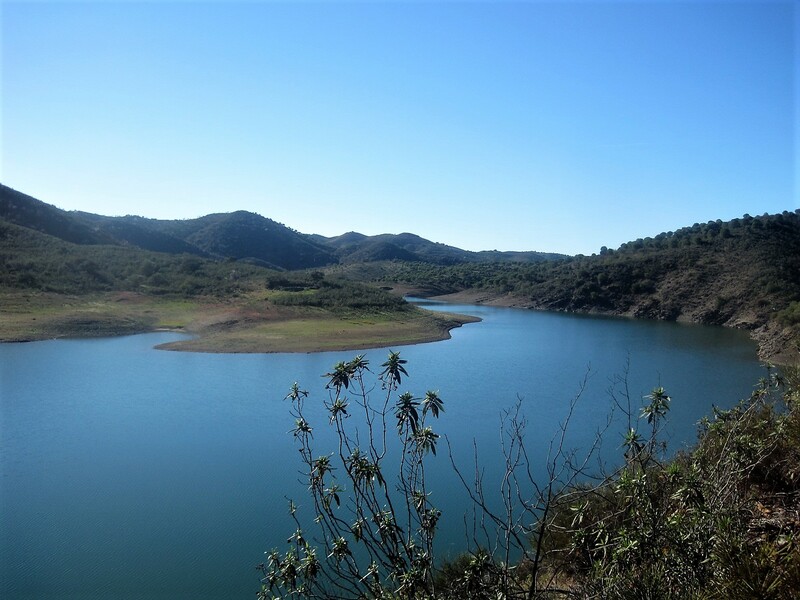 Not a trace of water- so far this has been a dry winter. The path started out on schist, the rockbed of much of the Algarvian hills. I was enchanted with the vibrant green grass, growing over and around the boulders, and dotted with a myriad daisies. An old stone wall accompanied us much of the way, till we crossed a road and left it behind. The blossoms were nodding, everywhere. We tiptoed past a row of beehives, anxious not to disturb the inhabitants. As we crested a hill, I caught my first glimpse of the dam. Just a snippet of blue in the distance, but it put a spring in my step. As we descended, the blue changed from heart shape to an azure oval, softly lapping a small island. Amongst all that blue, suddenly a flash of white caught my eye. I could hardly believe it! My first cistus of the year. Incredibly early! And then, a few metres away, a second. They are the most beautiful plants, and soon the hills will be full of them. I turned full circle to look at the dam, almost surrounding me at shore level. A lone boat sat, it’s nose in the water. I wondered if I might set it adrift, and glide smoothly into the silence, holding my breath as I counted the ripples. Even on this arid shoreline the daisies were flourishing, and I was astounded to find, nestling in shade, a clump or two of wild lavender. The bugs must have been busy, because next day I had a wonderfully itchy large red lump. Serves me right for messing with nature! 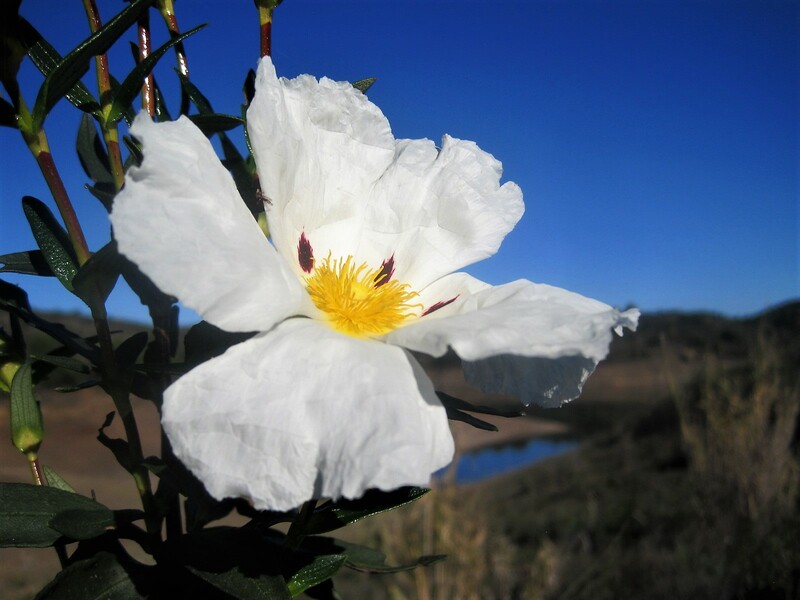 Reluctantly I set off back along the trail, pausing again to admire the cistus. It was mostly uphill going back so I was amused to note the inappropriate footwear dangling from a tree. The blossom spurred me on and eventually we were back to the road. The direction? Inevitably up, to the trig point, where late afternoon sun bathed the surrounding hills. Our target, Furnazhinas, there below. A full-on attack on the ski-slopes with Drake! And talking of cities, don’t miss my lovely friend Carol’s take on Toronto! That’s your reading matter for another week. Come walking next time? You’ll be very welcome here at Jo’s Monday walk. See you soon!